I was very excited about Mrs. Klein’s visit to Battle Creek. She’s was very moving, though we didn’t have enough time to take all the questions, alot of my questions were answered through her speech.She’s an ultra classy lady and I am so happy i met her. I truly enjoyed the presentation from Mrs. Klein. I learned so much from her. Her speech really moved me, as well as many others. Thank you so much! I feel fortunate to have been able to attend Gerdas presentation. I was skeptical about going and listening to the same story I read in her book. But, instead, she gave us more details about her life without being too repetitive. It was a great experience for me that will affect me as long as I live. I was deeply moved by Gerda’s presentation. I truly enjoyed the opportunity to hear her speak, to hear her views after surviving such an event. She has done so much for us all, and we are truly thankful for her time. Mrs. Klein’s presentation was very influential. I’m am glad students from the area got the opportunity to hear her speak. She touched everyone there and got her point across without going into detail about her concentration camp experiences. She made everyone realize how fortunate we are to live in a country where we are not threatened by our government like the Jews were. I was very pleased to be able to listen to Gerda’s presentation at W.K. Kellogg Auditorium. Her speech was very moving, and she had a lot to say about her life during the holocaust. She had a unique way of telling her story without all the negative things that happened during those fateful years. It was a great experience for me, and I’m sure for others as well. Thank You Gerda, and Thanks to the people that brought her to Battle Creek. 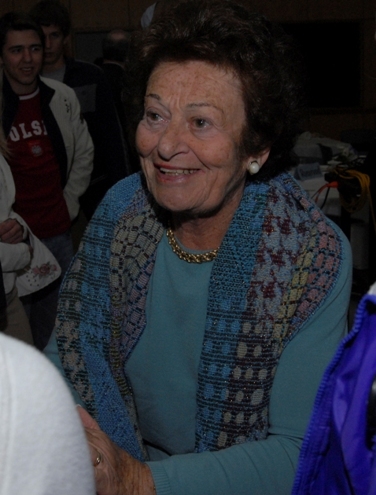 Mrs. Klein was very moving, I have heard from Holocaust survivors before, and she was different. She didn’t just tell us how it was, she told us about how she survives and how she was able to keep going through those hard times. Her message was conveyed in a way that we really understood it, and took it to heart. Thank you to those who made this experience possible. This whole experience has changed my reading her book and having the opportunity to meet and listen to her has made me a better person. Vanessa, 1st Block, Adv. Lit. When I first heard that we (my class) was going to read All But My Life and then that we would be hearing Mrs. Klein speak I was not too thrilled. I thought that her view on the Holocaust would be the same as every other survivor. I was wrong. Her view and experience seemed different to me and has changed my life or at the very least my appreciation for all those who lived threw such a hard time. Thank you to those who made such an amazing thing possible and to Mrs. Klein herself. At Harper Creek this was the first time that we had the opportunity to read Gerda’s book All But My Life together as a class. I think that Gerda’s book should continue to be taught here at Harper Creek because it makes you think twice about how much we take for granted and just how lucky we are. I also want to thank everyone who made all of this possible because it was very motivational and I learned a lot from Gerda’s experiences. I am so thankful for being able to attend Gerda’s presentation. I felt that Gerda delivered a very powerful message that made a huge impact on our community. Actually being able to see Mrs. Klein and hear her speak has touched me and has somewhat given me a different perspective on the Holocaust. Gerda’s presentation is an experience that I will remember for the rest of my life. I was excited to hear that our school had the chance to hear Mrs. Klein speak and have lunch with her. I thought she was a very good speaker and it was different to hear a life that actually lived through the Holocaust, than just hear information on it. Her story made me realize what real survival was. I thank the people who made all of this possible and especially to Mrs. Klein for speaking to us. I enjoyed Gerda Weissman Klein’s speech very much. It was a moving real-life speech up close and personal. I was excited to be able to see her in person after reading her story and the horrendous things that she went through. I felt that I could relate to her, so it was a wonderful opportunity being able to hear her speak and see her. I found irony in this speech though because of the fact that she was speaking of the Columbine shootings, and just that same exact day, before anyone knew, thirty-two people were shot and killed at Virginia Tech. Even as people were doing great, heroic, hopeful things like giving wonderful speeches to children in Battle Creek, MI, there was someone evil in Blacksburg, VA who wanted to cause grief, and kill. No matter what, there will always be evil in the world, and it is a sad, and scary thing, but Gerda’s speech made us have hope, and moved us in a way to help others, and to be good, not evil. She reminded us that we have the power to be good, and to do good, which is what I intend to do. I hope others will feel the same way, because yes we do have this little thing called free will, but I hope that we can realize that doing good is a much better route, than doing evil. Thanks to Mrs. Lincoln for bringing this exquisite, enlightening lady to our town to help spread the good. Adam, 1st block, Adv. Lit. I’ll save everyone by not reiterating the same things over but i will say this about Mrs. Klein: the tragedy in her early life, while terrible, did leave her with infinite wisdom in the matters of life and death and how to approach both with a class unmatched by most of the world. Paul, 1st block, Adv. Lit. In 6th and 7th grade I learned more about the holocaust than any other years of school. All i can remember is always wanting the opportunity to listen to an actual survivor. This chance came to me when I started blogging on this site with my Adv Lit class. I feel honored that gerda came into my home city of Battle Creek and spoke in front of hundreds of students. I think Gerda made a great impact on all the kids including myself. She changed my thaughts on things i take for granted and let me relize what really makes one happy. Thanks Gerda your a trooper. Kathi, 1st Block, Adv. Lit. From the first page on I loved “All but my Life” and couldn’t stop reading it. Therefor I was really excited when I heard that we were going to listen to Gerda! I absolutely loved her speach, and she really made an impact on me. I adore because she doesn’t forget about other people even though something terrible happened to her. I think Gerda’s a great role model, and in my opinion everybody should be a little like her. I don’t think Adam could have put it any better. Gerda is an amazing woman, who has inspired me to look on the bright side of life. I feel very fortunate that I was able to listen to her speak. It was an awesome experience that I hope more students will be able to enjoy. It was amazing seeing Gerda and hearing her story. She is such a sweet lady and she is doing such great things for the people of this country. I am so proud that I had a chance to see her, listen to her, and learn from her. Getting to hear the speech was defintely an impacting experince. I felt lucky to have been there to hear it. It was very inspiring. I was really glad to see Mrs. Weissmann Klein in person. Even though I’ve heard some of her stories, it was much more moving hearing it come from her lips then from a book that cannot hold emotions. From what my World at War teacher’s mouth, he said that she wanted to meet us all but there wasn’t enough time. I am still amazed that someone could come out of that experience and still be very humble and not bitter. I am very thankful that we got the chance to go see Gerda speak. She gave an amazing speach that defiantly taught me to be thankful for what i have and to not take anything for granted. It is not often that i meet such a strong person as Gerda. Katie O. World at War. Grace and Adam said it. Watching Gerda speak inspired me to try and live my life fully, without any regrets. Thank you for coming to battle creek it shows that in all the hatred in the world there are people out there that are trying to teach the good. It makes me treat people how i want to be treated. Gerda’s speech was very inspirational and uplifting. We both feel inspired to do more to help others. The experience changed our point of view on how we view the community because we value the people around us more. We also treat our friends and families with more respect. Gerda’s stories focused more on the positive views of life during the Holocaust which made her stories more enjoyable and influential. We would both like to thank Mrs. Klein again for telling us about her experiences through out the holocaust and people like her that give others the hope to live. I truly enjoyed Gerda’s presentation at the W.K. Kellogg Auditorium. It was an unbelievable experience. She not only inspired me, but so many others with her story. She has gone through so much devestation and for her to keep going and live a happy life is so remarkable. For her to recall all of the negative and detailed things of her past and still remain in an enjoyable state is just beyond belief. Hearing her story lifts me up and makes me believe that through a hard time, things can get better. She is a wonderful human being that has taught us so much. To read and hear her story and then to meet her was just such an amazing opportunity and I enjoyed every minute of it. I only hope that in the future we as a younger generation can take what she has taught us with her strength, and put it into action. I will never forget all of this, for it has had a great impact on my outlook on life. Thank you Gerda, Thank you so much. Josh, World at War, 2nd block- Gerda Weissmann Klein’s presentation was very good and i enjoyed spending my morning-afternoon time to listen to what she had to say. Her story was very good and i enjoyed the fact that she didn’t do what most presentors do and tell their story but she explaned why certain things happened and how certain events changed her life. i also was very touched on how she was not letting what has happened in her earlier life affect what she does for her new country now. She has taken was has happened and tried putting it in the past the best she could and that is something that anyone who has read her story would consider amazing. Also, Gerda was very poisitive minded and you can tell that she is an amazing person just by the way she went about presenting her story and what she has went through throughout her life. Gerda is a very inspirational woman and will continue inspire young people until the day she dies.